Kimberly Johnson works to board the windows and doors of Tommy Condon’s Restaurant on Market Street in downtown Charleston, S.C. as residents prepare for Hurricane Florence to make landfall along the East Coast. Hurricane Florence’s fierce approach to the East Coast is expected to slow down and crawl through North Carolina and South Carolina late Thursday or early Friday, bombarding communities with torrential rain, high winds and deadly storm surge until Saturday. “Although slow weakening is expected to begin by late Thursday, Florence is forecast to be an extremely dangerous major hurricane when it nears the U.S. coast,” the center said in its early evening forecast Thursday. “Preparations to protect life and property should be rushed to completion,” the NHC bulletin warned. 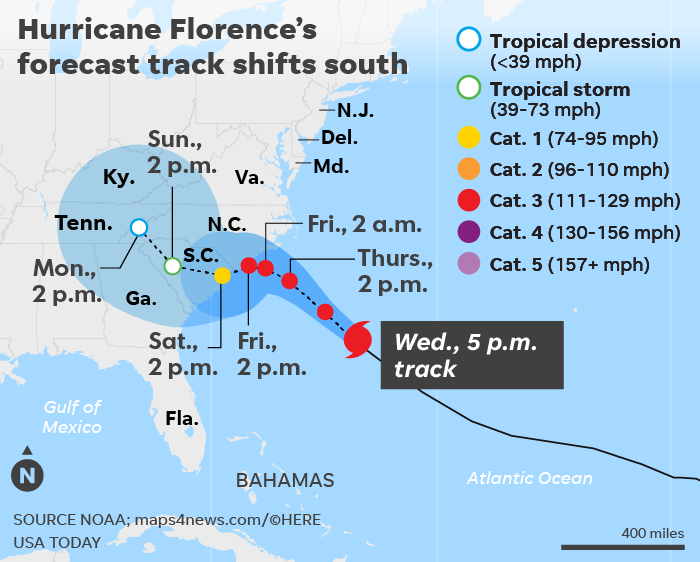 After an earlier flirtation with up the coast toward Virginia, the southern turn brings Georgia into the path of the storm. Gov. Nathan Deal declared an emergency Wednesday for all 159 counties. But North Carolina remained a primary target, and Gov. Roy Cooper has ordered an unprecedented evacuation of the state’s barrier islands. “Every county and every person in North Carolina needs to stay alert and to take this storm seriously,” Cooper said. President Donald Trump again warned people to heed storm warnings on Wednesday, saying Hurricane Florence “is going to be one of the biggest” to ever hit the East Coast or the United States as a whole. There is “a big situation confronting us,” Trump said during a White House reception for Congressional Medal of Honor recipients and their families. Trump said his administration is in close contact with state and emergency management officials. “God bless everybody, and be careful,” Trump said. Weather Channel meteorologist Greg Postel said Florence has an unusual forecast track. “I’ve never seen anything like this,” he said. President Donald Trump lauded FEMA for its work during last year’s devastating hurricane season and said authorities were ready for Florence.